PAPERSTIX FROM THE HOUSE OF SETTER. QUALITY. MADE IN GERMANY. 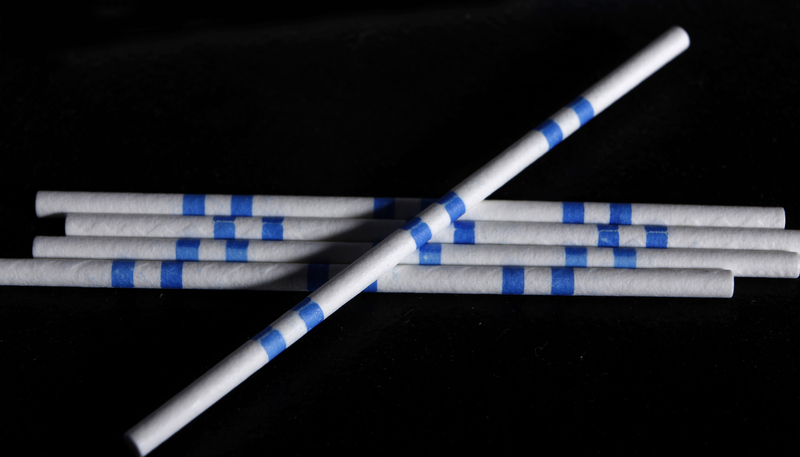 The brand name SETTER-PAPERSTIX stands for absolute superior quality in the production of paper sticks for lollipops, sweets, cotton swabs, medical applications and special applications. Our guarantee for this success are the over 50 employees of SETTER Germany, who work around the clock to satisfy the wishes of their worldwide customers. 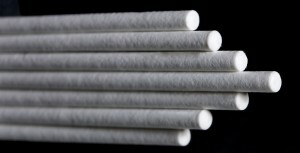 Founded in 1963, SETTER Germany is the only manufacturer of such paper sticks in Germany. 90 % of the products manufactured on a total area of 3.500m2 at the company´s headquarters in Emmerich are exported in countries all over the world. Simply select an area in the sub- menu that particularly interests you- or just get in touch with us directly. SETTER-PAPERSTIX are made of TCF (Total Chlorine Free) cellulose. Contrary to plastic sticks, our products are made of raw materials from a renewable source from controlled forest certification schemes (PEFC and FSC®), unlike the crude oil used as the raw material for PP sticks, which will only be available for a limited number of years. SETTER-PAPERSTIX dissolve completely, which makes them biodegradable and therefore they pose no threat to the environment. 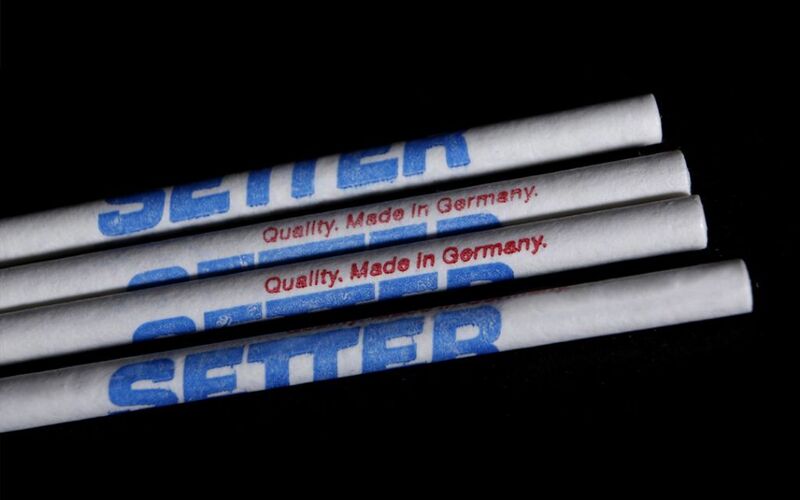 We at SETTER Germany take our responsibility for the environment and the future generations of our children very seriously and therefore use a few environmentally harmful materials as possible when manufacturing our sticks. We are a longstanding member of the FSC® (Forest Stewardship Council®). FSC-C113192 and PEFC (Programme for the Endorsement of Forest Certification Schemes) PEFC-BV/CdC/8666434. 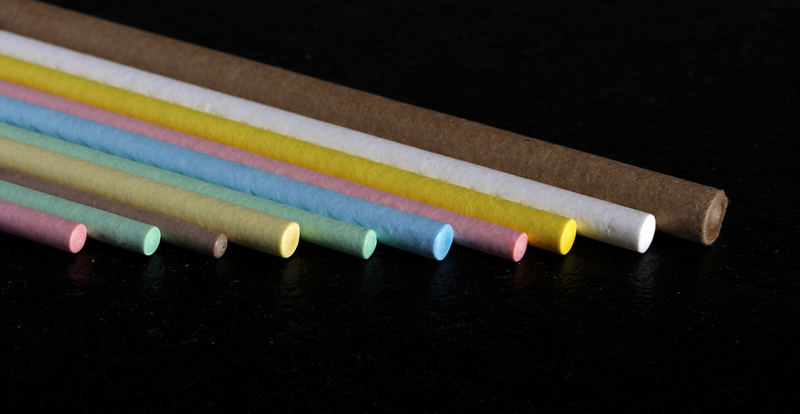 SETTER PAPERSTIX are made from natural raw materials and contain no chemical additives such as optical brighteners. They meet all food and health regulations worldwide, as we can prove with our health certificate. SETTER PAPERSTIX do not splinter and have no sharp ends. For use in the food sector, they offer maximum safety and protection from injuries to the mouth, as despite their high stability, they will bend if necessary. SETTER-PAPERSTIX run excellently on all types of lollipop production machinery. They guarantee dimensional accuracy in length and diameter, which is essential for high processing rates and economical production. SETTER-PAPERSTIX do not jump during production and are not subject to static cling. They enable a higher level of productivity as compared to PP- sticks. 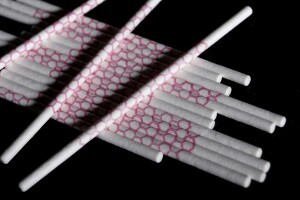 SETTER-PAPERSTIX are made of specially selected and produced paper. They can be produced in line with our customers’ requirements in many standard dimensions and varying degrees of stiffness, and with high flexibility. 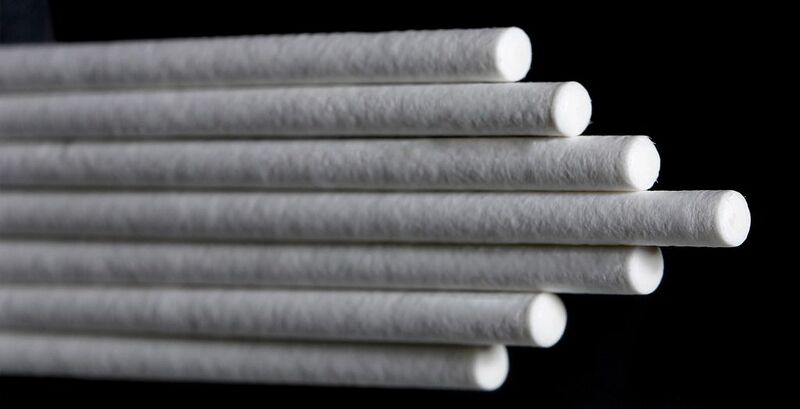 SETTER-PAPERSTIX are made using the latest technologies on modern machines, which have been designed and built by ourselves, with a tolerance of only 1/100 mm in both length and diameter, and are suitable for further processing on production lines of all kinds. As we always use raw paper of the same specifications and quality, we also ensure constant technical characteristics of our SETTER-PAPERSTIX in terms of stiffness grades, weights and dimensions within very narrow tolerances. Compliance with all warranted technical specifications is monitored by an end-to-end quality system bothuring and after production. 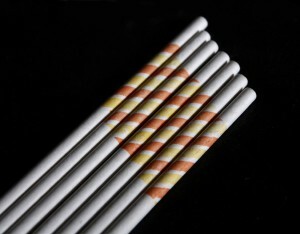 SETTER-PAPERSTIX are available in various combinations of length and diameter as well as a number of possible colours. Of course, they can also be produced to the specific requirements of the customer, for example with a print in one or more colours. 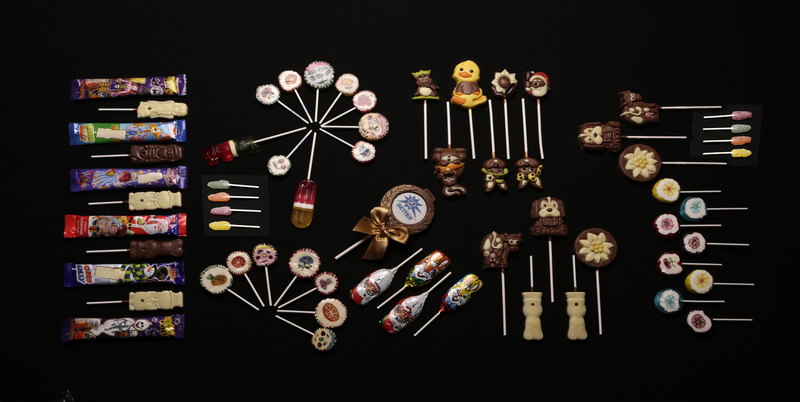 SETTER-PAPERSTIX are used around the globe for the production of ball, flat, deposited, figure-shaped and fancy lollipops. They run excellently on all types of standard production machinery and guarantee the best production and safety results. SETTER-PAPERSTIX for lollipops are available in a range of lengths, diameters and colours. We can also provide our paper sticks with a custom- tailored print (up to three colours) – of particular interest are the readable barcodes. And if you have any questions, please get in touch with our Sales Manager. SETTER Germany is the very first manufacturer to print readable EAN/UPC barcodes on paper sticks. This innovation is today being used by many customers all over the world. Whether a logo or decorative design – almost any pattern can be printed on SETTER-PAPERSTIX using up to three different colours. We would be glad to advise you about the many implementation possibilities. Do you need more information or a personalised offer? Then please write us. Just ask for some colour samples and see for yourself. Our customer service staff will be happy to receive your inquiry. Intended specifically for use of in lollies, SETTER has developed a special “water-resistant”, lick-proof PAPERSTIX variety that delays the disintegration of the lolly sticks even on intense contact with saliva. This prevents the unpleasant experience of finding small bits of paper in the mouth while eating a lolly. This product type naturally meets all worldwide food and health regulations. Our customer support team will be pleased to help you in case of any further questions. 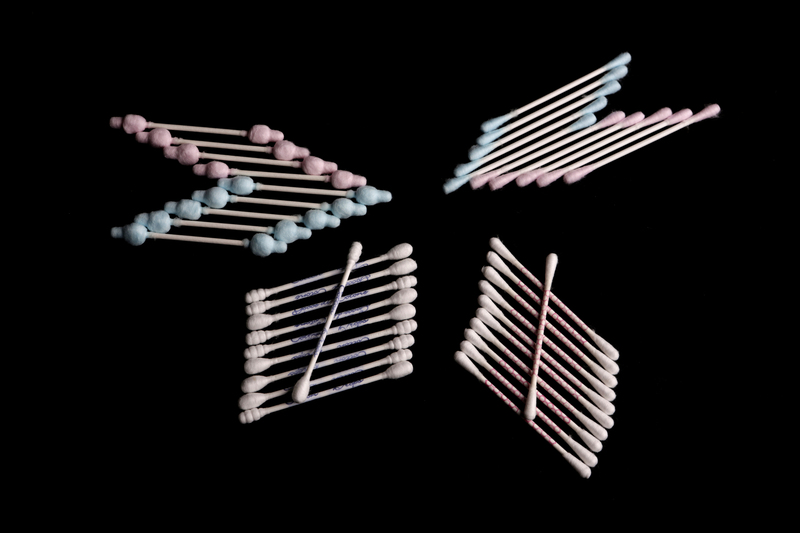 SETTER-PAPERSTIX are used throughout the world in the production of cotton buds. 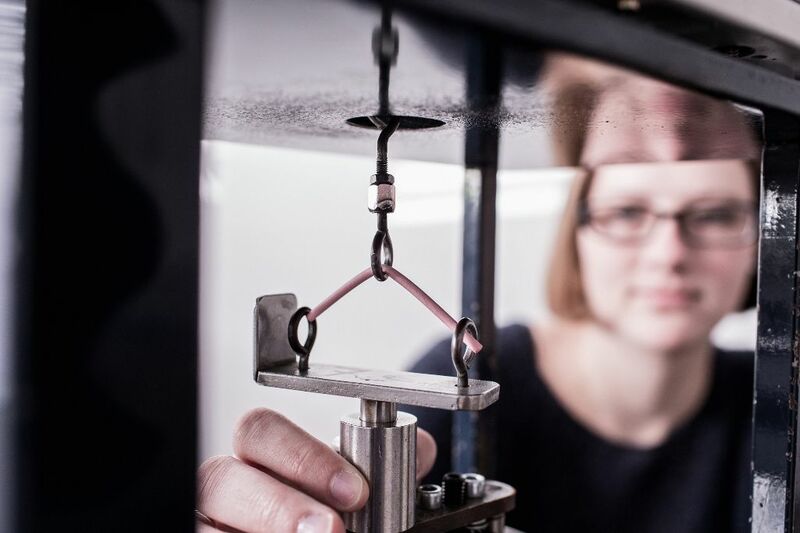 They can be processed without problem on standard machines of all kinds – even at very high speeds – and guarantee best production and safety results. SETTER-PAPERSTIX for cotton buds are available in different lengths and diameters, and also in a choice of colours. They can even be printed to customer specification in up to three colours. 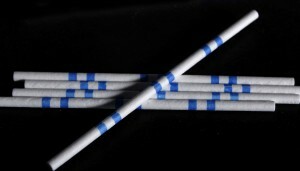 SETTER-PAPERSTIX are produced in the following standard sizes. And if you have any special requirements in terms of length and/or diameter, please get in touch with our Sales Manager. Whether a logo or decorative design – almost any pattern can be printed on SETTER-PAPERSTIX using up to three different colours. We would be glad to advise you and help you make your products unique and unmistakable. Do you need more information or a personalised offer? Then please write us. SETTER-PAPERSTIX products are available in many different lengths, diameters and colours for use in different applications. Individually printed finishes can also be supplied (up to three colours). Please contact our customer support team for solutions for your particular application. Please contact our customer service for minimum order quantities and the use in special applications. Whether a logo or a decorative design – almost any pattern can be printed on SETTER-PAPERSTIX using up to three different colours. We would be glad to advise you and help you make your products unique and unmistakable. For any special wishes or unanswered questions, we are at your disposal any time. The author does not assume any warranty or liability for the up-to-dateness, accuracy, completeness or quality of the information provided. All liability claims against the author based on loss or damage of a tangible or intangible nature caused by use or non-use of the information provided or by the use of faulty and incomplete information are barred except in cases where the author can be proved to have acted with wilful intent or gross negligence. All offers are without engagement and are subject to change without notice. The author expressly reserves the right to modify, supplement or delete parts or the whole of this website without prior notice or to cease publication of it either temporarily or permanently. In the case of direct or indirect references to external websites („hyperlinks“) which are outside the area of responsibility of the author, the author would incur liability only in the event that he had knowledge of the content of a site and that it would have been technically possible for him, and reasonably expectable of him, to prevent use in the case of illegal content. The author hereby expressly declares that at the time of creating the hyperlinks, no illegal content was discernible on the linked sites. The author has no influence on the current or future design, content or authorship of the sites to which the links are provided. The author therefore hereby expressly disassociates himself from all content of linked sites which have been modified since the hyperlink was created. This declaration applies to all links and references provided within our website as well as to entries made by third parties in guest books, discussion forums, lists of links, mailing lists and all other forms of databases created by the author within the author’s own website and to the content of which external write access is possible. Liability for illegal, faulty or incomplete content and in particular for loss or damage resulting from the use or non-use of such information shall lie exclusively with the provider of the site to which the link was provided but not the party who merely draws attention via links to the publication concerned. In all publications, it is the author’s enadeavour to observe the copyright of the images, graphics, audio documents, video sequences and texts used or to use images, graphics, audio documents, video sequences and texts created by himself or to use licence-free graphics, audio documents, video sequences and texts. All brand names and trade marks that are named on this website and may be the property of third parties are subject without restriction to the provisions of the relevant trademark law and the rights of title of the respective registered owners. It may not be concluded from the mere naming of them that brand names are not protected by the rights of third parties! Copyright for objects created by and published by the author himself shall be deemed vested exclusively in the author of the site. Reproduction or utilization of such graphics, audio documents, video sequences and texts in other electronic or printed publications is not permitted except with the express consent of the author. In cases where the possibility exists within the website to enter personal or business data (email addresses, names, addresses), the disclosure of such information shall be deemed voluntary on the part of the user. The use of and payment for all offered services, even without the disclosure of such data or with the use of anonymised data or a pseudonym is – to the extent technically possible and reasonable – permitted. Use of the contact data provided in the Impressum or other similar information, such as postal addresses, telephone and telefax numbers and email addresses, by third parties for sending information which has not been expressly requested is not permitted. We expressly reserve the right to take legal steps against the senders of so-called spam mail in the case of any breach of this prohibition. This disclaimer must be seen as part of the website from which reference to this page was made. If any part or particular formulation of this website should not, or should no longer, or should not be wholly in conformity with the law in its currently valid form, the content and legal validity of all the other parts shall nevertheless remain unaffected.